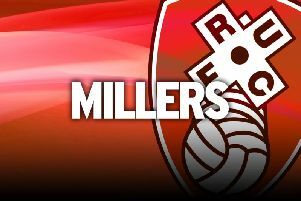 Rotherham midfielder Will Vaulks enjoyed the boot being on the other foot as his side won a game they might not have deserved to. The Millers were outplayed in the first half against Preston on New Year's Day but somehow went into the half-time interval in front, thanks solely to Vaulks' thunderous free-kick. They improved after the break and Michael Smith doubled the lead before they held on to record a 2-1 win which moved them out of the relegation zone. Paul Warne's men have bossed plenty of games this season and have not got the points return they perhaps deserved, so Vaulks was happy to take the win, whatever the circumstances. “We've had a lot of games in a short amount of time,” he said. “This match was all about getting three points. We'll take the 2-1 win. “I was saying in the shower afterwards, how many times have we played well, been beaten and come off lower than a snakes' belly? “We were in the dressing room after this game and we'd won but we weren't particularly elated because we'd not played well. You've got to enjoy the wins, though. They're hard to come by at this level. Meanwhile, boss Warne says the new long-term contract handed to teenager Ben Wiles shows just how highly regarded he is at the club. The 19-year-old has been handed a deal until 2022 as a reward for his first-team breakthrough this season. Wiles has made 11 appearances for the Millers this season and has not looked out of place in the Championship. “Wilesy has been excellent and has worked hard to earn this new deal,” Warne said. “He has impressed us in both his physical and technical development since he’s been with us as a professional and we hope that this contract is just one of many more he signs with Rotherham United. “We’ve used him in a lot of games this season and we trust him like we trust any other first team player here and I think we showed that when we brought him on at Middlesbrough.